I believe wedding invitations usually reflect who the couple are, and give the guests the first glimpse of the special DAY! My hubby and I love simplicity, and our wedding card reflects just that. He absolutely loves red and white. I wanted something different compared to the usual red and white. We compromised and came up with - Black and white with a twist of red. 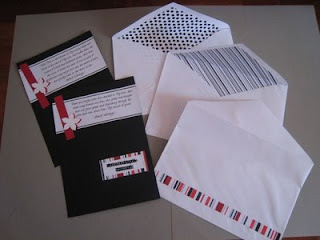 I'm crazy about stripes and incorporated that into our card. 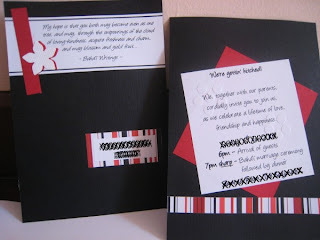 And being an all-time handmade lover, my wedding invitation, of course, had to be handmade too! I scrounged around for papers, and made use of some of the papers from my own collection. I discovered many new cardmaking techniques and a wide variety of papers along the way. I fell in love with it all and decided it's time to pursue this passion of mine. I seriously get a thrill just looking at beautiful papers, thus the name PaperThrill. I love the flowers embossed at the back of the card. This was my first time trying out embossing and it was real fun! I didnt plan to have to many wordings on the card, and so I felt a no-fold card would suit us better.